Our Graphic Collection comprises underwear in custom, Walking Jack exclusive, sublimation prints. Walking Jack Sea Print Trunks are inspired by the Greek islands featuring a design that will put a smile on your face and warmth in your heart. Timeless style combined with ultimate comfort in a high quality garment for men, designed and made in Europe. These white and blue trunks are made from an excellent quality, soft polyester based fabric, with elastane added, to give you the right amount of stretch. The waistband is blue, super soft with a luxurious, almost shiny finish bearing the Walking Jack logo in white letters front and centre. The pouch is contoured to give you room and support exactly where you need it. Printed trunks by Walking Jack with blue, soft waistband. High quality underwear that goes the distance for men who appreciate comfort and contemporary style. This garment is designed in Greece and manufactured in Portugal. Flat lock seams inside the pouch to reduce irritation. Contoured pouch for hold and extra room. Soft waistband with a luxurious, shiny finish. Woven label with washing instructions. Easily removable (by hand) size label. Free shipping is processed by registered Post. 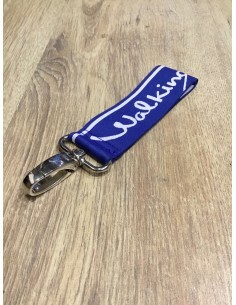 Multi-purpose blue lanyard by Walking Jack. Perfect for hiking, the gym or your house keys. Made from top quality elasticated band and a strong belt loop carabiner. The size is perfect to wear around your wrist or attach it on your belt hoop or your bag. You can use it for your house keys, car keys or gym locker keys.